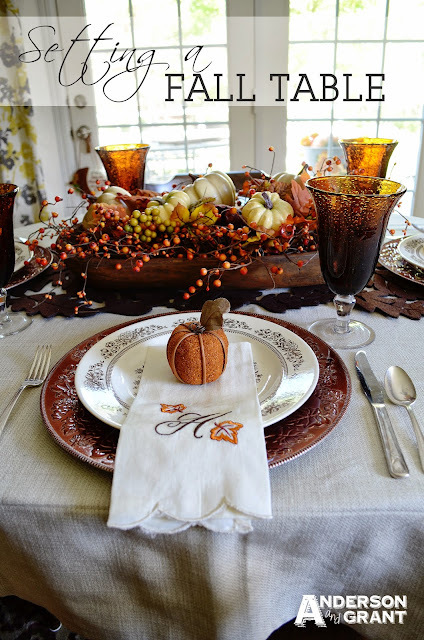 As I've said in the past, fall is my favorite season for decorating and that includes setting a lovely table. I enjoy using nice dishes and vintage silverware, and adding some special touches to make my guests feel like I've taken the time to make their evening enjoyable. Setting a nice table is no different than decorating a home. You need a mixture of new and vintage, fancy and a bit more casual. You also need a mixture of colors, patterns, and textures. I enjoy an eclectic mix of elements that all come together for a cohesive look. 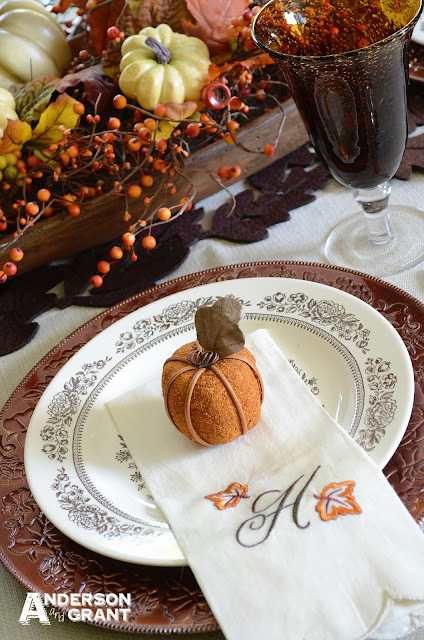 For this tablescape, I was inspired by the colors of fall....brown, orange, and copper. 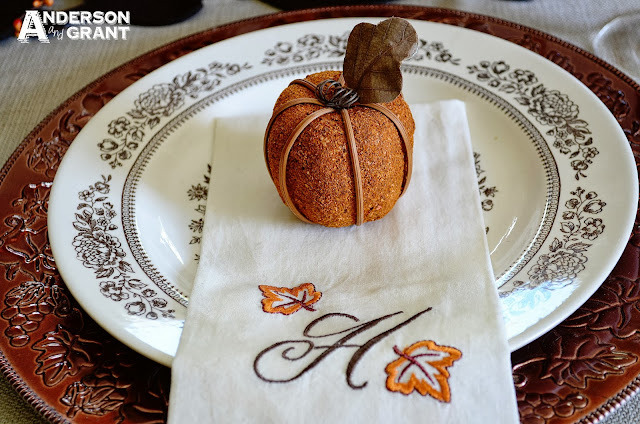 The tablescape started with my tablecloth, which was purchased at recently from Target. 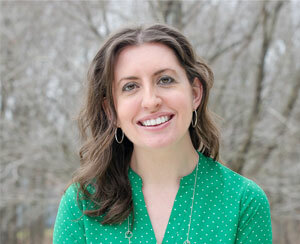 It is a light neutral shade, but has a great textured pattern. The table runner is made of heavy felt and looks like cutout leaves. 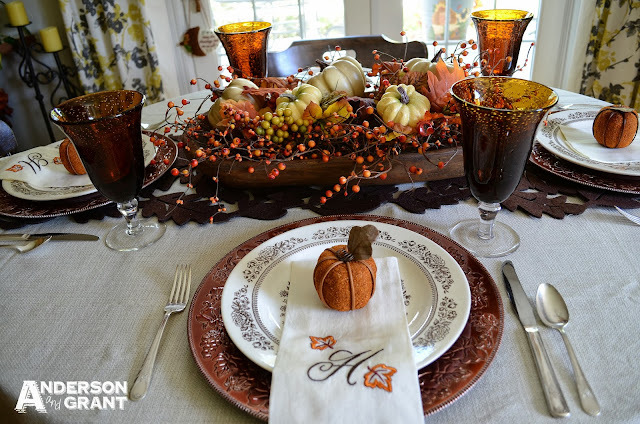 The dinnerware used on the table is a perfect example of using new mixed with vintage. The brown glasses were purchased at Target and the copper colored chargers at Hobby Lobby. 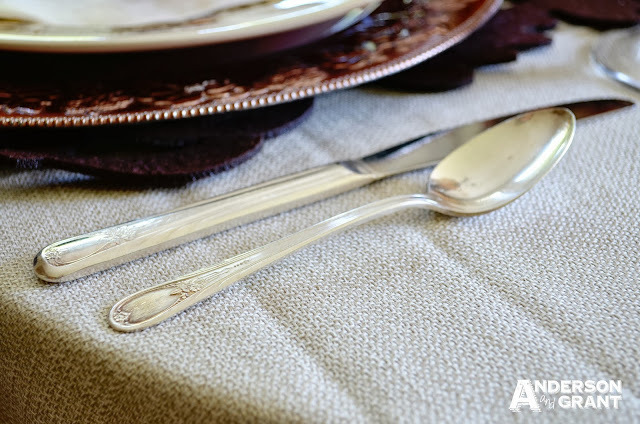 The silverware is vintage silver that has been passed down in my family. The beautiful plates are old, but purchased at Goodwill. 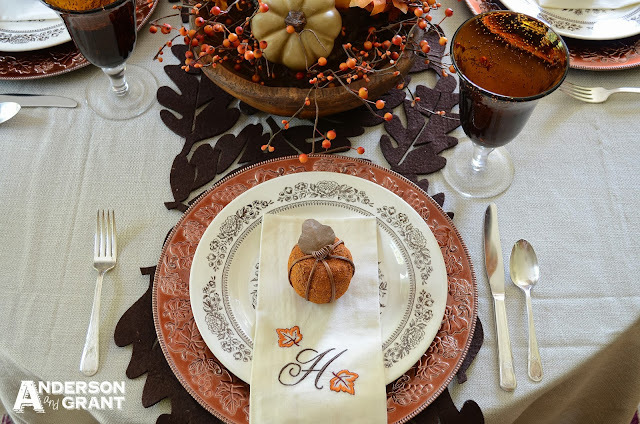 I just love the brown transferware pattern and think they make a nice statement on the fall table. Thrift stores are a fabulous place to pick up some dishes to be incorporated into a fancy table. Your plates don't even have to match as long as they all coordinate together. For less than a dollar a plate, you can add a unique look to your table. Resting on the plate is a cloth napkin purchased at Kirkland's. I worked really hard to find enough of them monogrammed with the letter H! I think the embroidered monogram is one of those special touches I mentioned. This shows that you put a little effort into setting your table. The focal point of the table is my centerpiece. I used a reproduction of a wooden dough bowl and filled it with an orange berry garland, a few leaves, and some cream colored pumpkins. I love that it fills the center of the table, but is low enough that it doesn't interfere with conversation across the table. Everything that I used to set this table was something that I already had around the house. 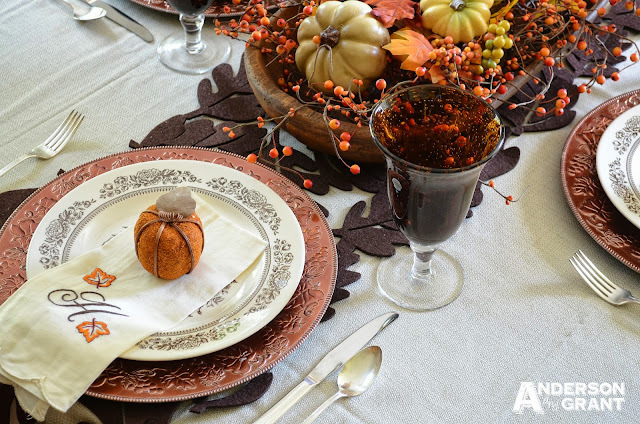 Some of the things like the dough bowl and plates aren't even actual fall items, but that doesn't mean they can't be added to the mix. 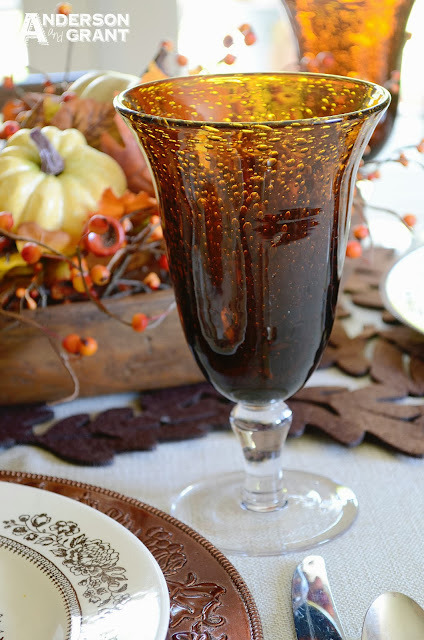 When you are setting a table, look around your house and see what you can use in an unexpected way. Mix and match your dishes. Add some nice cloth napkins. Find a showpiece to set in the center of the table. Light some candles. 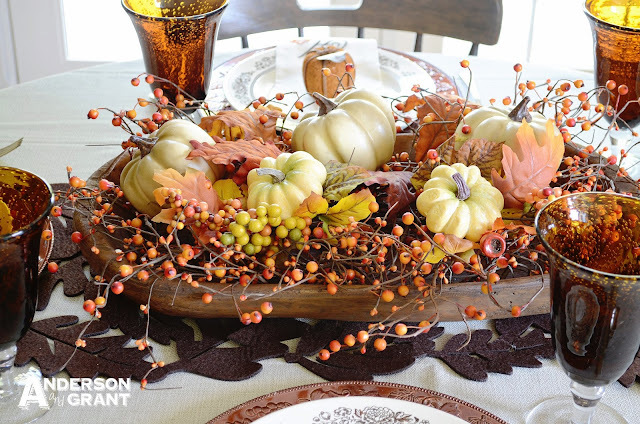 What can you add to your tablescape that will make things a little more interesting? The goal of a beautiful tablescape is to make sitting at your table enjoyable and special for you and your guests and I think my table does that......what is your favorite part?